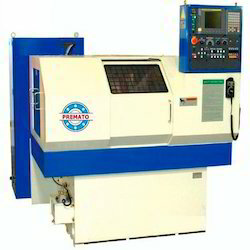 We are leading manufacturer and supplier of CNC Cylindrical Grinding Machine. Client can avail as per their requirements. »: Table traverse and tailstock mounted dresser. »: Angular/straight wheel head facility. »: High rapid traverse for slides. »: Turcite pasted table guideways. »: Preloaded antifriction guideways for wheel head slide. CNC controlled vertical direction grinding machine. We offer Cylindrical Grinding Machine. - Simultaneous 2 Axis Control. Our company has created niche in the field of offering CNC Cylindrical Grinding Machine. With vast experience and knowledge we are involved in offering a premium quality range of CNC TWIN Wheel Cylindrical Grinder. These products are manufactured using optimum quality material and latest technology machines. These are highly acclaimed among our clients due to their smooth operation and resistance against corrosion.